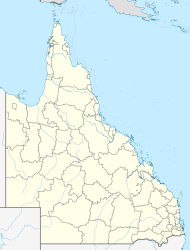 Not to be confused with Camboon, Queensland. Cambroon is a locality in the Sunshine Coast Region, Queensland, Australia. In the 2011 census, Cambroon had a population of 373 people. The locality has a population density of around five persons per square kilometer. Almost all the people living in Cambroon speak English, and most people are married as well. Cambroon is located on the Mary River. It is on the Maleny-Kenilworth Road. It is situated about 98km away from Brisbane. Cambroon takes its name from the pastoral run of the same name, which was established in 1855 by J. D. MacTaggart. The name of the pastoral run is believed to be the name of an Aboriginal leader at the time of first contact. Cambroon Provisional School opened on 5 February 1923 and was upgraded to a state school on 1 December 1924. The school closed in May 1944. ^ a b Australian Bureau of Statistics (31 October 2012). "Cambroon (SSC)". 2011 Census QuickStats. Retrieved 7 June 2014. ^ a b "Cambroon (entry 47856)". Queensland Place Names. Queensland Government. Retrieved 7 June 2014. ^ "Early History". Kenilworth Museum. Archived from the original on 24 June 2014. Retrieved 8 June 2014. ^ "Agency ID8926, Cambroon State School". Queensland State Archives. Retrieved 8 June 2014. This page was last edited on 16 May 2018, at 02:52 (UTC).